a few weeks ago, we’ve received great feedback from our merchant partners and also from our customers--who are enjoying access to our expanded collection of 30+ daily deals for foodies, adventure seekers, families and more. There’s no doubt that people love getting personalized offers and merchants benefit from connecting with the right customers. That’s why we’re happy to announce that we’re expanding deals from our partners to Google Offers subscribers in New York City. Starting today, New Yorkers can also find a greater selection of offers and receive multiple deals that match their personal interests all in one place, and accessible through the web, in email, or on their mobile device. Today we’re also expanding our roster of partners to include CityLikes, Dealster, Eversave, and Weforia. We’ve also enhanced the Google Offers site design to make our expanded inventory of offers more easily discoverable and personalized to subscribers interests. 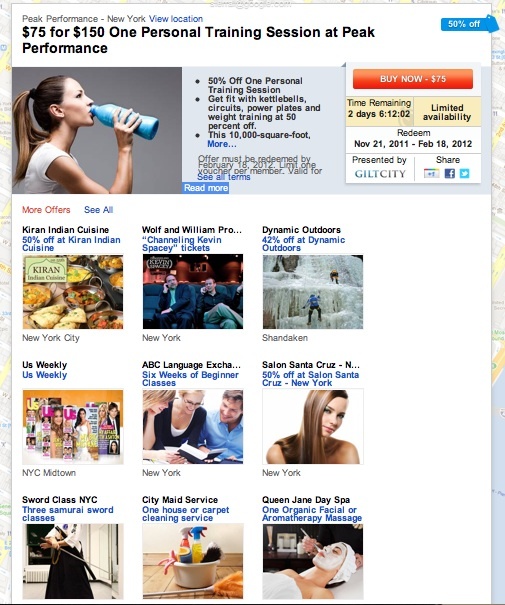 With the new Google Offers site design, even more deals from our partners are visible on each page. In the coming months, we’ll continue to roll out our growing inventory of deals to more markets where Google Offers is available. You can subscribe to receive deals that match your interests and learn more about Google Offers at www.google.com/offers. Also, you can always find deals from Google Offers on the go with the Google Offers app on Android. If you’re a deal provider and are interested in working with Google Offers, please contact us via this form. The world’s holiday shopping capital now has more holiday cheer. Since we introduced a larger selection of personalized deals in San Francisco a few weeks ago, we’ve received great feedback from our merchant partners and also from our customers--who are enjoying access to our expanded collection of 30+ daily deals for foodies, adventure seekers, families and more. There’s no doubt that people love getting personalized offers and merchants benefit from connecting with the right customers.